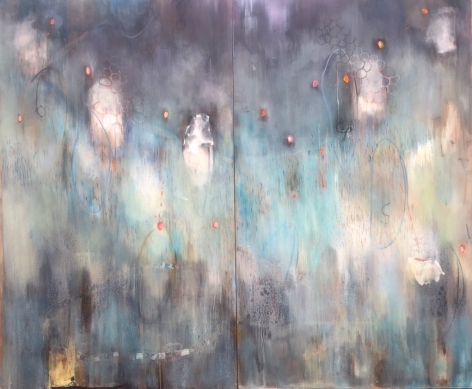 Friesen Gallery will showcase a history making exhibition with the abstract paintings of internationally recognized Tom Lieber and exciting large-scale sculptures created by his daughter Lila Roo Lieber. 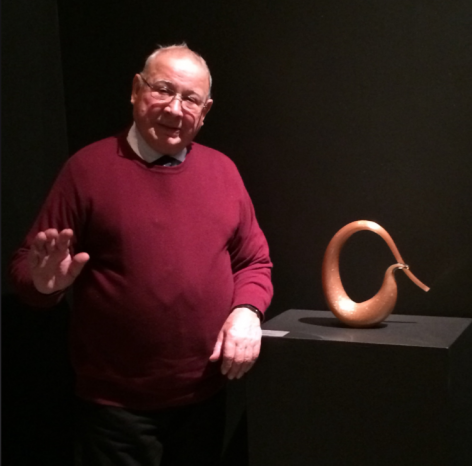 The first two-person exhibition for this intriguing father-daughter, titled “Lineage,” will have its opening reception on 28 December from 5:00-8:00 p.m. Tom Lieber will be in attendance. Sun Valley’s origin story isn’t tied to mining or laying railroad tracks. Rather, it's the birthplace of resort skiing in North America, following its 1936 founding by lifelong skier and Union Pacific Railroad chairman W. Averell Harriman. Snow-starved Hollywood celebrities (like Cary Grant and Earnest Hemingway) reinforced Sun Valley’s rep as the place to see and be seen, and a whole new generation fell in love with the central Idaho region. Click the link below to read Jettsetter Magazine's full review. . .
and would encompass roughly 900,000 acres in central Idaho. A key requirement of the designation is that communities within the reserve's boundaries, like Ketchum and Sun Valley, commit to minimizing their own light pollution. 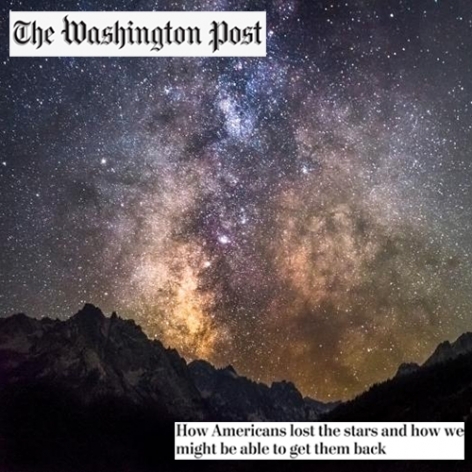 Most of those communities already have light pollution ordinances in place, making the region an ideal location for the country's first Dark Sky Reserve. 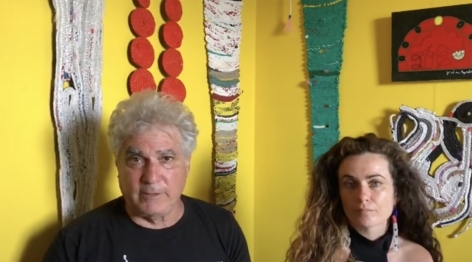 . .
Joseph Gallivan interviews artist Dana Lynn Louis about La Grande Robe, her installation at Front of House Gallery. 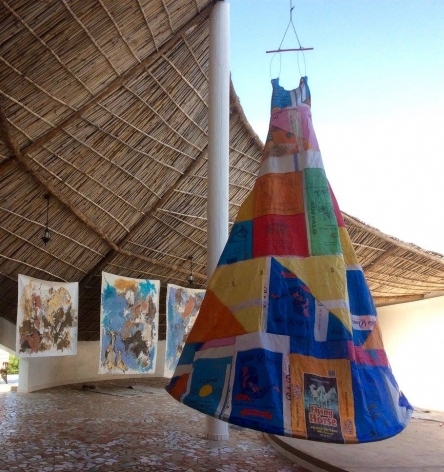 The installation of two large dresses made from plastic rice sacks in Senegal comes with many stories behind them from Louis’s trip to Africa a year ago. 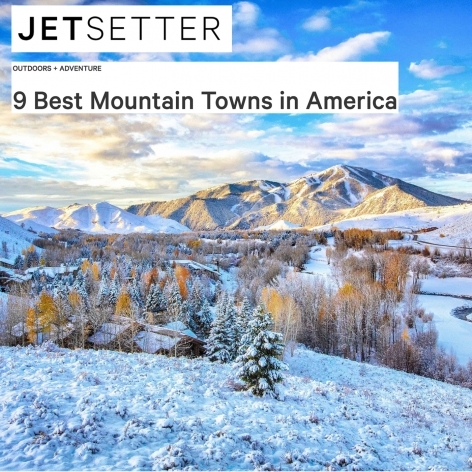 Travel + Leisure magazine took some time to dig in to the common Sun Valley, Idaho phrase that goes, 'come for the winter, stay for the summer.' Their findings reavowed that 83340 is more than just a skiing hotspot. 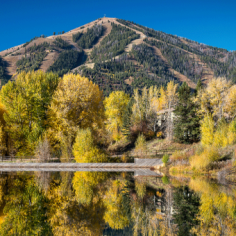 Read T+L's itinerary for a perfect summer day in Sun Valley. . . 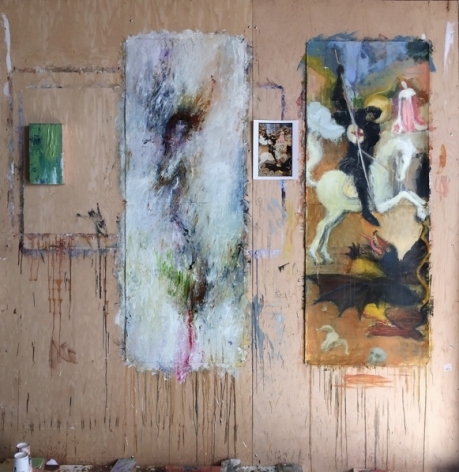 Jumping into an 'open studio' session at Lauren Mantecón’s studio in Santa Fe involves more than art, and includes some wine, à la liquid courage, to delve into your emotions, and some artisanal chocolate to boost your senses. 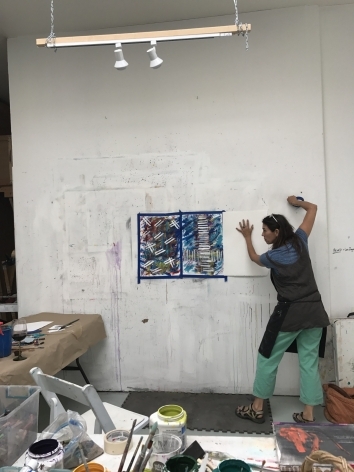 Lauren guides you through the two hour session and helps you to present your feelings on paper, and create a masterpiece that is unique from a variety of mediums including paint, chalk, pencil, and pastels. 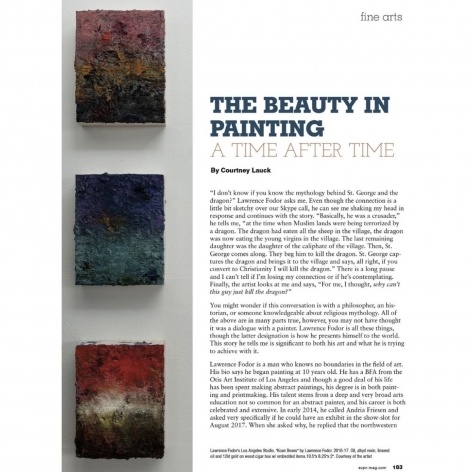 Just when you think you are done, she guides you through further exploratory, and continually creates an environment where you are safe to experiment with colors, shapes, feelings, and more. 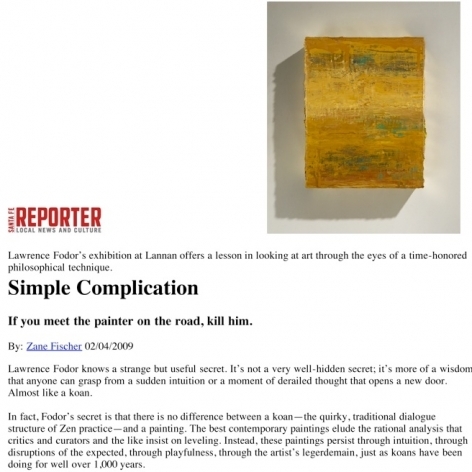 . .
What is the connection between art and contemplation? For centuries artists have created religious objects meant to offer a contemplative or devotional experience. 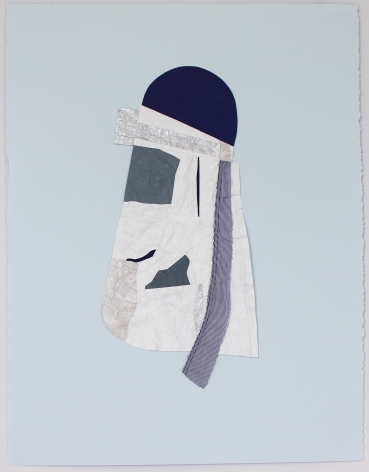 But how do art and contemplation intersect outside established religious traditions? 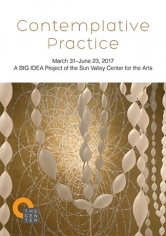 This BIG IDEA project at The Center in Ketchum uses work by artists engaged with contemplative practices as the basis for a larger investigation of the role of meditation and mindfulness in our world today. 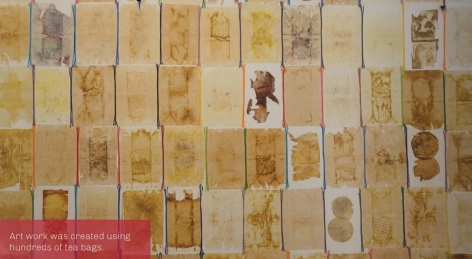 Featuring the work by artists Dana Lynn Louis, Pegan Brooke, Meg Hitchcock and Serra Victoria Bothwell Fels. 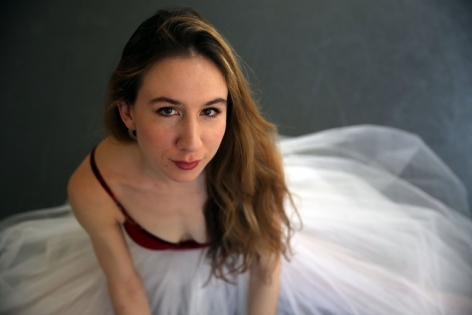 This summer, Isabella Boylston, the American Ballet Theater principal, will realize a dream, to bring ballet to her hometown, Sun Valley, Idaho. Ballet Sun Valley, a three-day event with performances Aug. 22 and 24 at the Sun Valley Pavilion, and free classes for children on Aug. 23, will feature dancers from major companies, including Ballet Theater, New York City Ballet, the Royal Ballet, San Francisco Ballet and the Mariinsky Ballet. She is hoping that Ballet Sun Valley will turn into an annual event. Along with works by George Balanchine, Alexei Ratmansky, Christopher Wheeldon and Justin Peck, Ms. Boylston will dance the part originally created for Sara Mearns in Mr. Peck’s The Bright Motion. . . If ever there was an artist with revolutionary tenacity, it would be the multitalented painter, printmaker, photographer and activist, Dana Lynn Louis. 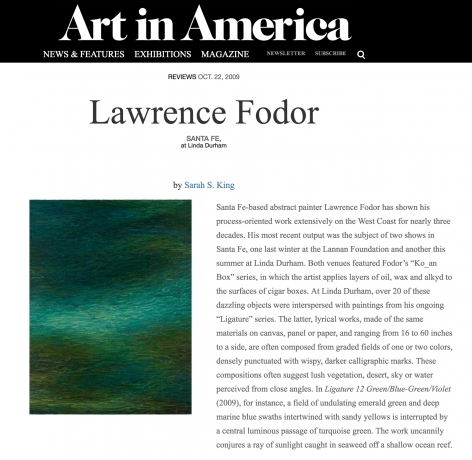 Louis, whose interdisciplinary work to-date has spanned both small- and large-scale installations have called upon all manner of media––among them drawing, painting, photography, sculpture, glass-blowing and video projection––is the newest addition to the roster of impressive contemporary artists at Friesen Gallery. 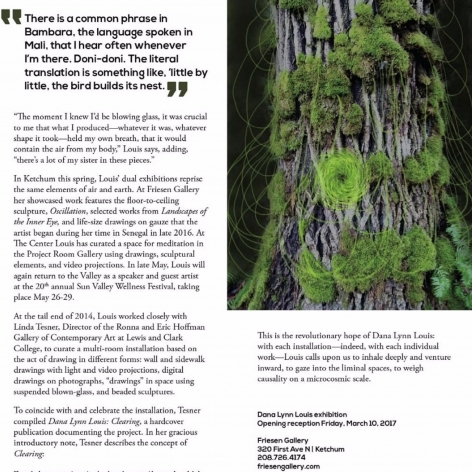 This March, Louis makes her Sun Valley début in simultaneous installations at Friesen and The Sun Valley Center for the Arts in Ketchum that examine the correlation between creative output and contemplative practice. . . 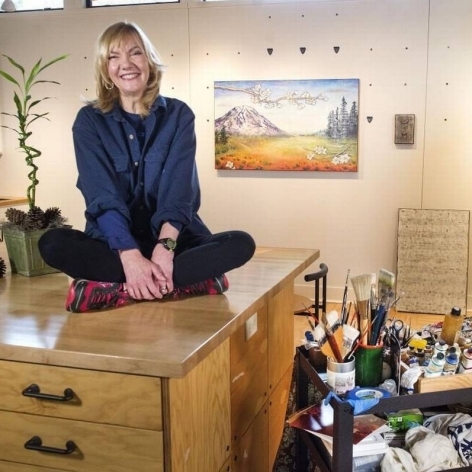 In 1986, now Sun Valley resident Andria Friesen was directing an art gallery in Nevada when she decided to strike out on her own. 'I’m not too proud to say I didn’t know anything when I started at 26. I don’t know why someone didn’t say, What are you doing?' she told the Idaho Mountain Express in a 2011 interview. 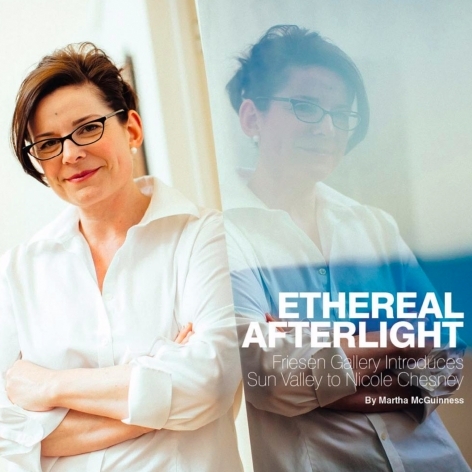 'I’m glad I didn’t, because knowing what I know now, there’s no way I would have done it.' . . . 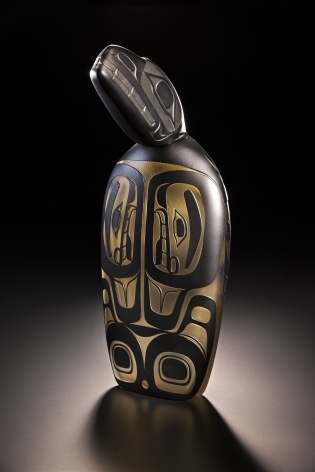 This December, Friesen Gallery embarks on its thirtieth year, an anniversary traditionally represented by the pearl. To mark the occasion the Gallery will showcase an exceptional new body of work entitled 'Lustrare' from artist Nicole Chesney. 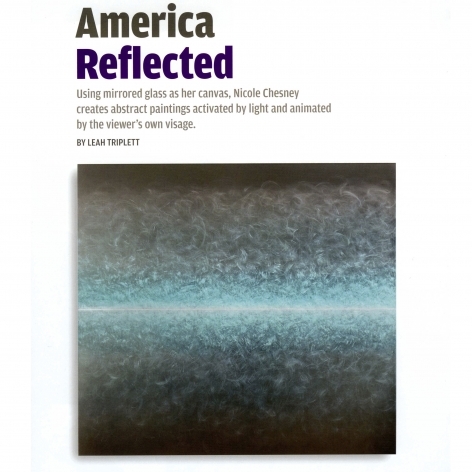 Widely recognized for her oil paintings on etched, mirrored glass, Chesney acts with mastery, using the properties of light and reflection to cultivate a sense of seductive mystery and profound beauty. 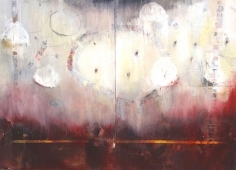 In addition to her site-specific large-scale commissions for 7 World Trade Center in New York City and Massachusetts College of Art in Boston, Chesney’s paintings are exhibited and collected internationally. 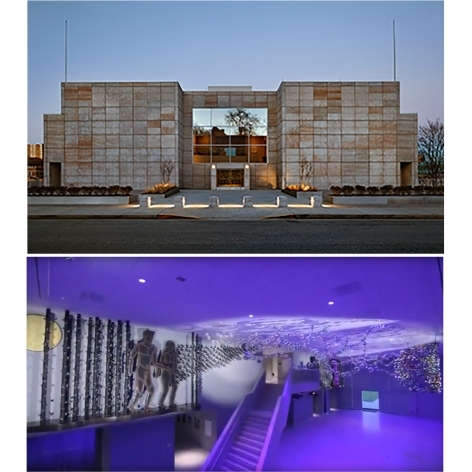 Awards received by this impressive artist include the UrbanGlass Award for New Talent, The Corning Museum of Glass Rakow Commission and a Jutta Cuny-Franz Foundation Supporting Award. 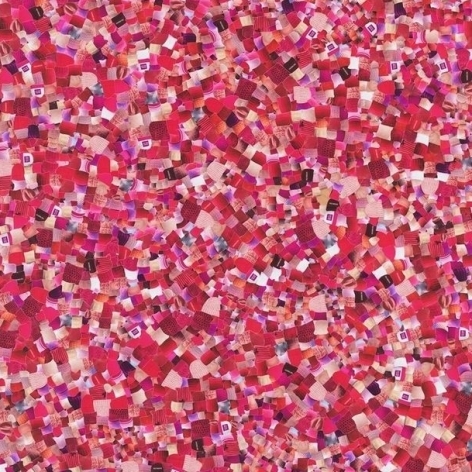 'Lustrare' is a luminous celebration of this milestone in Friesen’s history. Toys. The great unifying force. Who doesn’t break into a grin at the memory of a favorite childhood plaything? Even the terrible Burgermeister Meisterburger had a softening moment when handed a yoyo in the holiday classic, Santa Claus is Coming to Town. 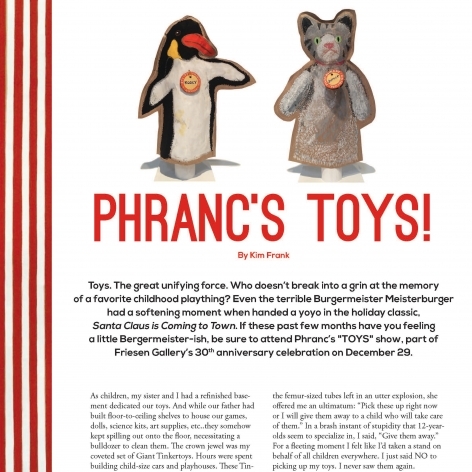 If these past few months have you feeling a little Bergermeister-ish, be sure to attend Phranc’s 'TOYS' show, part of Friesen Gallery’s 30th anniversary celebration on December 29. 'Making toys for this show let me time travel,' says Phranc. 'I have created toys that I once had. Toys I wished for but never got. Toys my father had. Toys my brother had. Toys my friends had. Toys that I dreamed of having.' . 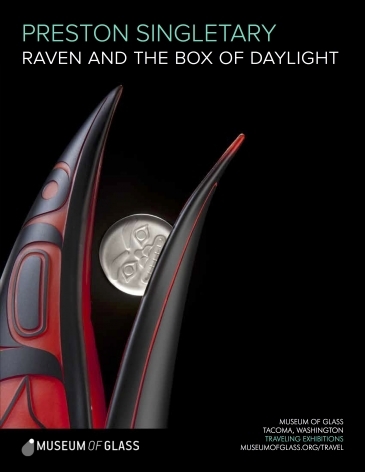 . .
Raven and the Box of Daylight is the Tlingit story of Raven and his transformation of the world—bringing light to people via the stars, moon, and sun. 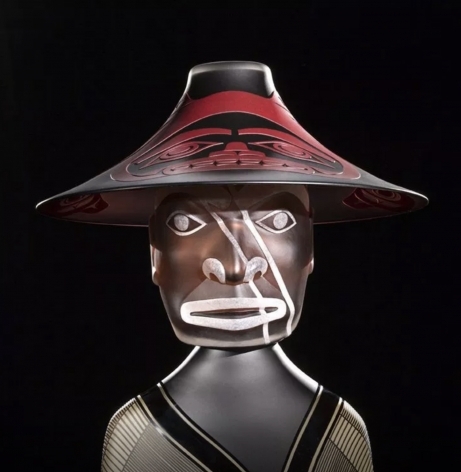 The exhibition, which features a dynamic combination of artwork, story-telling, and encounter, takes visitors on an experiential journey with Raven, and the transformation of darkness into light. 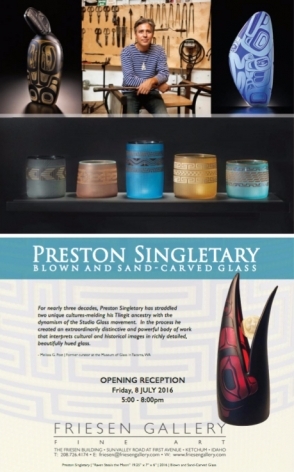 Artworks by Preston Singletary, inspired by the creation myth and Tlingit art, are enhanced by exhibition text and audiovisual experiences. . .
It’s easy to fantasize about living in one of these 16 adventure meccas, but to really understand how great they are, you have to be on the ground. Sun Valley, Idaho, right next door to Ketchum, was America’s first ski resort and the site of the world’s first ski lift, developed in 1936 from a conveyor used to move bananas off ships. Skiing is still central to the community’s spirit. 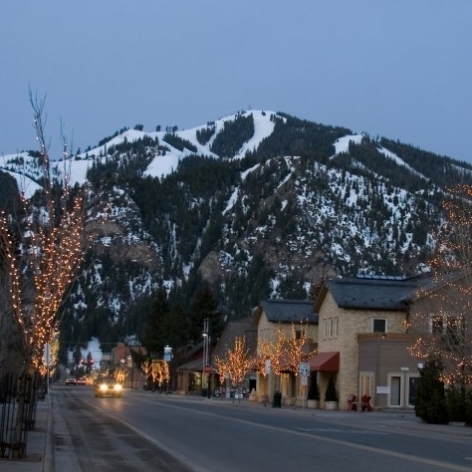 With its ritzy history and fine-dining and drinking establishments plus hundreds of miles of manicured ski slopes and singletrack, Ketchum has a glamorous face. 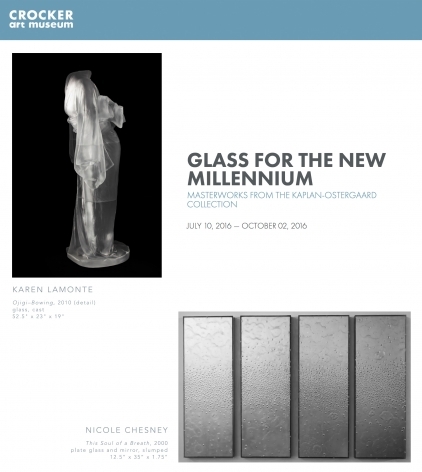 . .
'Glass for the New Millennium: Masterworks from the Kaplan Ostergaard Collection' highlights contemporary studio glass works from around the world. 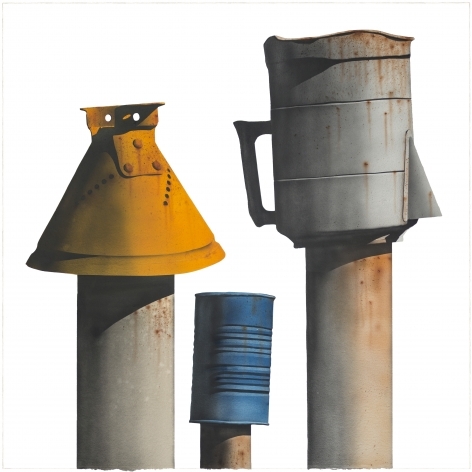 Strong works, all abstract, come from Jan Exnar, Steve Klein, Nicole Chesney and Claire Falkenstein, (the subject of a retrospective coming to Crocker this fall). Of these, Chesney’s 'The Soul of a Breath' stands out. Bathed in shimmering gold, grey and silver, the four panels of the piece change color anamorphically as you move from side to side. Bubbles on the surface, along with spectral amoeba shapes dusted in chalky white, evoke a living ecosystem whose vaporous quality calls to mind Turner and Rothko. 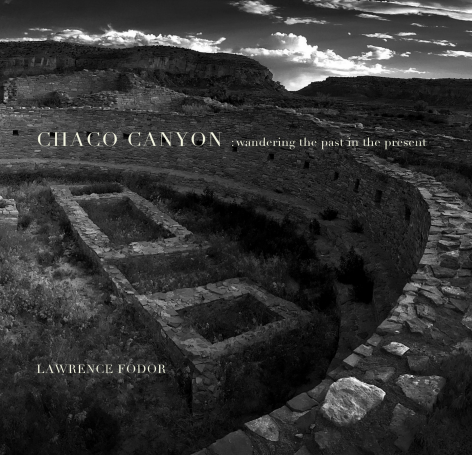 . .
Join host Mark Perry and his guest Lauren Mantecón in exploring how evolution and creativity are evolving. 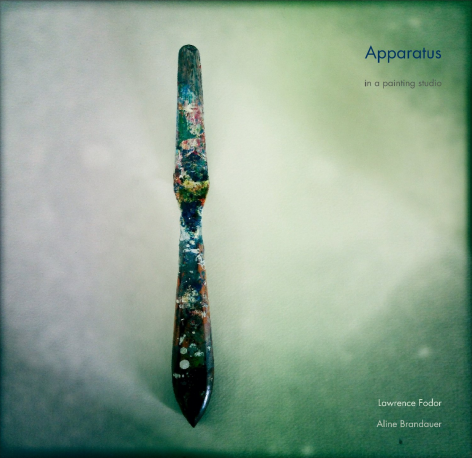 Lauren is a fine artist and art teacher who guides creativity through tools and processes for 'un-learning' the blocks to our natural and authentic selves. 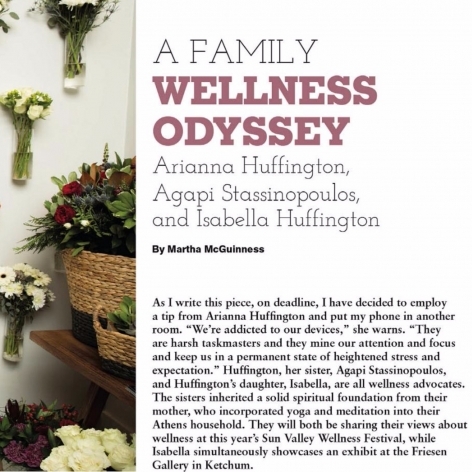 She also draws from her study, practice and guidance through astrology and the Human Design system. . .
barely discernible, just coming into focus. 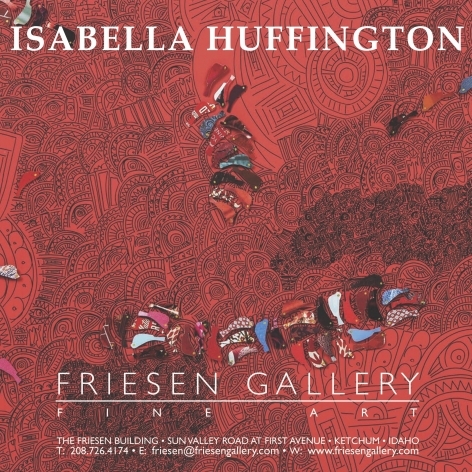 . .
Friesen Gallery is known for setting remarkable exhibitions and for sharing the meaning and value of art in the world. 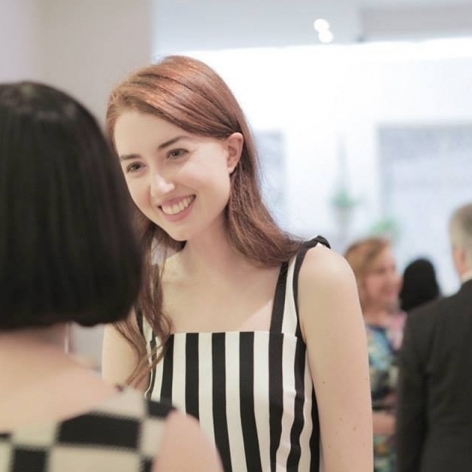 Andria Friesen and the gallery staff work everyday to showcase incredible work by talented creators and arrange different shows to meet the artists and explore their work.  'Lino is important on so many global levels. 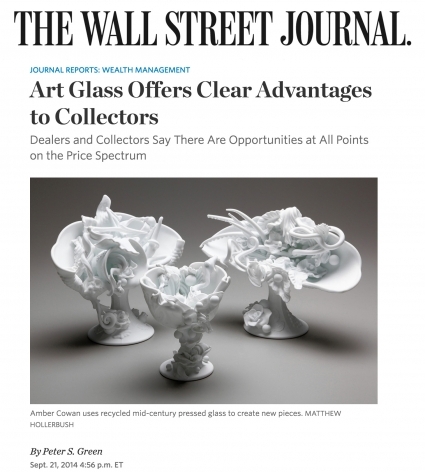 He has changed the future of glassblowing forever. He is a true artist,' says gallery owner, Andria Friesen. 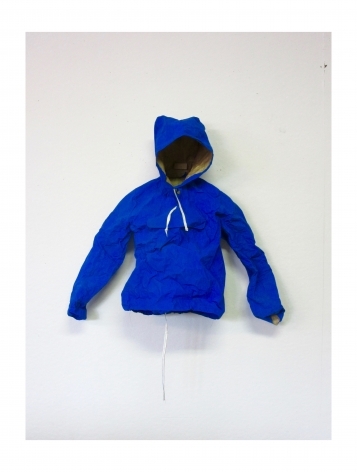 . .
Says artist Lauren Mantecón, "The idea of 'creative block' is a left-brain concept. Amateur or expert, we are constantly taking in information. How we choose to use the fruits of our curiosity might result in doing something creative or not. And how long we need to integrate and process information is personal and different in everyone. The unreasonable pressure to constantly be delivering creative product is the real 'entirely imaginary and inflating disease' afflicting many artists." . . .
Richard Jolley's sweeping glass installation, Cycle of Life: Within the Power of Dreams and the Wonder of Infinity, is one of the largest figurative glass-and-steel assemblages in the world. 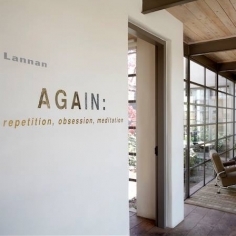 Commissioned in 2009 especially for the Knoxville Museum of Art, Cycle of Life is a seven-part narrative that took the artist and his team of studio assistants more than five years to create. It reveals Jolley's exceptional artistic rigor and vision—an aesthetically stunning masterwork that is also an engineering marvel. . . Visual artist and musician Phranc is as iconic as the art she creates. Rising to fame on the Los Angeles punk rock scene in the 1980s, Phranc toured as the opening act for many well-known bands of the era, including a long stretch with Morrissey (The Smiths). While better known then for her musical prowess, Phranc was also making her mark as an emerging pop artist with shows in New York and L.A. 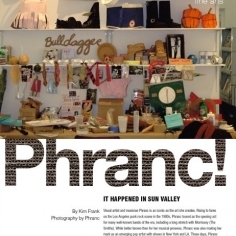 These days, Phranc is is still producing music, and her paper and cardboard sculptural art is gaining serious traction, with comparisons to the work of Andy Warhol and Claes Oldenburg. 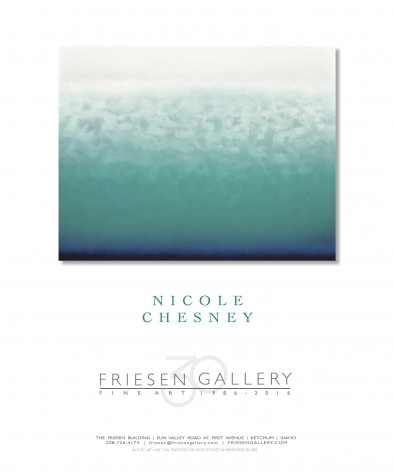 . .
Nicole Chesney, who paints mirrored glass plates evoking stormy skies. . . 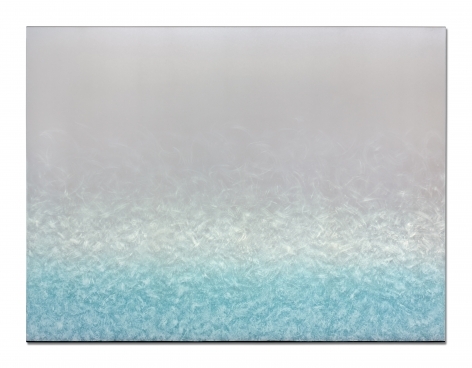 This new installation in the Linde Family Wing for Contemporary Art’s Eunice and Julian Cohen Galleria offers a contemporary spin on landscape art. 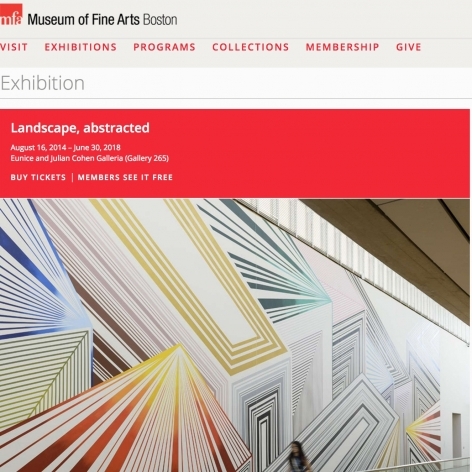 Ten works, including sculptures, paintings, installation, and video art, present contemporary art as the latest chapter in the story of landscape art through the ages, as told by the MFA’s encyclopedic collection. 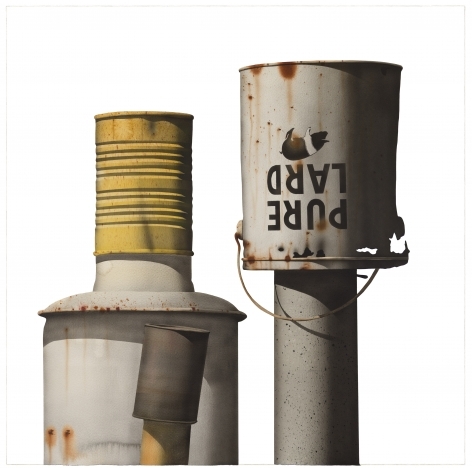 Works include a number of new acquisitions that have never before been on view, as well as new commissions by Jason Middlebrook and Anne Lindberg. Other works on view in the installation include 'Garrowby Hill' (1998) by David Hockney and 'Verity (magenta blue), Repose, and Verity (blue green gray)' by Nicole Chesney. 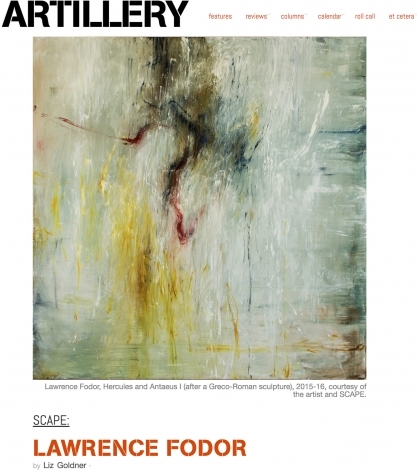 . .
Capturing an ephemeral moment through which we can view our culture and ourselves, the surface treatments of the Luminists and Abstract Expressionists are similarly vulnerable in that they bear the particular markings of individual artists. 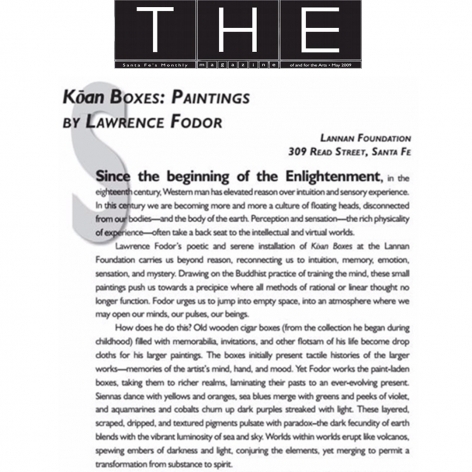 Both the Luminists and the Abstract Expressionists sought to express a reflection, be it of their place, or of their inner selves, on the painting's surface. 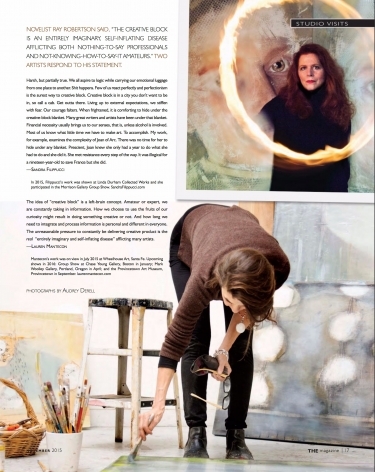 Building on both of these uniquely American approaches to painting, Rhode Island-based artist Nicole Chesney probes reflection, perception, and light in her paintings on glass, fusing a Luminist interest in light with an Abstract Expressionist focus on the psychology of an individual. 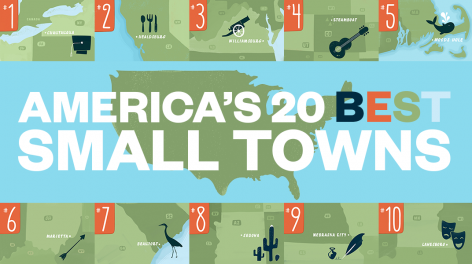 . .
Smithsonian Magazine has named Ketchum as one of America’s 20 Best Small Towns to Visit in 2014. 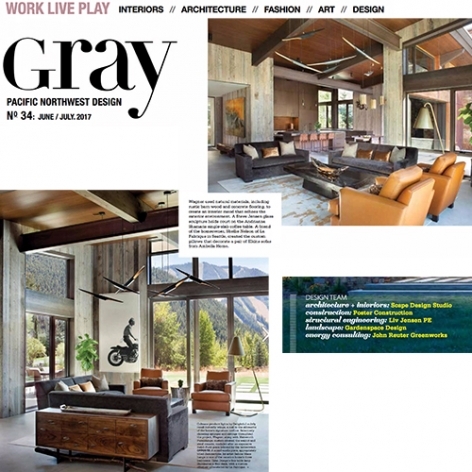 'Present-day Ketchum is a celebrated center for arts and culture in the Wood River Valley,' the article points out. 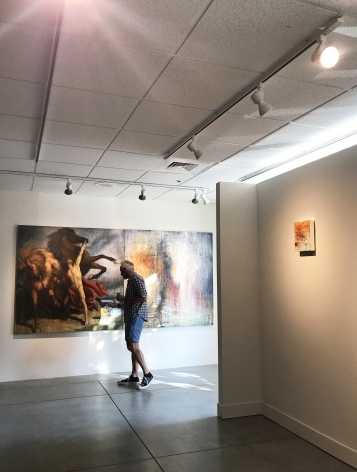 'The town is home to 20 art galleries and boasts a year-round lecture series, as well as various musical and theatrical productions at the Sun Valley Center for the Arts.' . . .